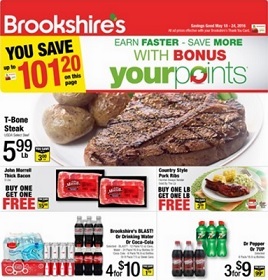 Brookshire’s Weekly Ad Specials, valid April 17 – April 23, 2019. This Week Brookshire’s Ad best deals, and grocery savings on: John Morrell Thick Bacon; T-Bone Steak; Hormel Always Tender Country Style Pork Ribs; Finish Quantum Max Dishwasher Detergent; Finish Dishwasher Detergent; Lysol Disinfecting Wipes; Lysol Cleaners; Air Wick Freshmatic Auto Air Freshener Refill; Ajax Laundry Detergent; Frito Lay Fritos Or Cheetos; Folgers Or Dunkin’ Donuts Coffee; Yellow Or Zucchini Squash; California Cherries; Fresh Express Salad Blends; Scott Bathroom Tissue; Scott Paper Towels; Pilgrim’s Family Pack Boneless Skinless Chicken Breasts; White Shell-On Shrimp; Certified Angus Beef Boneless Rump Roast; Green Giant Vegetables; Hormel Always Tender Pork Tenderloin; Full Circle Wild Alaska Keta Salmon Fillets; Mini Personal Watermelon; Italian Cream Cake; and more. Find all deals and offers in the latest Brookshire’s Weekly Ad for your local store.